Aviv Amirav, Professor of Chemistry at Tel Aviv University and Director - Aviv Analytical Ltd, December 4, 2013. Effective explosives analysis is very important for homeland security and forensic applications. However, explosives analysis is challenging and the number of explosive compounds that require monitoring is growing with time. Furthermore, the growing use by terrorists of peroxide explosive compounds such TATP (triacetone triperoxide, C9H18O6) and HMTD (Hexamethylene triperoxide diamine, C6H12N2O6) implies that modern analytical techniques of explosive analysis must be as effective with peroxide explosive as with the traditional poly nitro explosives. In fact, there is no limit to the desirable LOD and selectivity of explosives analysis but these features must be combined with an analytical system that enables the analysis of the entire explosives family used by terrorists. We note that the actual system sensitivity and selectivity should be measured by its performance with the most difficult to analyze explosives such as the peroxide explosives and not with TNT and alike. Keep reading to find out how the Aviv Analytical 5975-SMB GC-MS with Cold EI uniquely enables the sensitive analysis of the full range of explosive compounds including TATP, HMTD, R-Salt, TNT, ETN, PETN, RDX, Tetril, HMX and Urea Nitrate while providing abundant molecular ions or high mass fragments that improve the detection selectivity and identification capability of these labile compounds. Be able to analyze all the explosive compounds that are in active use today and preferably with one method of analysis. Improve the analysis sensitivity particularly for explosives compounds that are difficult to analyze such as the peroxide explosives. Improve the selectivity of explosive analysis via the enhancement of the molecular ions and/or high mass fragments in the explosives' mass spectra. Sample: We received the following samples of explosives that were synthesized by A.I. Explosives, Inspection & Services Company (www.aiexplosives.com): TATP, HMTD, R-Salt, TNT, PETN, ETN, RDX, Tetril, HMX and Urea Nitrate. These explosives were dissolved in methanol or acetone in various mixtures. Injection: 1 µL at 160ºC with injection split ratio of 20. He column flow rate: 10 ml/min for the first 1.2 min followed by flow program at 100 ml/min.min to 20 ml/min final flow rate. Oven: 50ºC followed by 30ºC/min to 230ºC and wait 1 min for the total run time of 7 minutes. Cold EI Source: 12 mA emission, 70 eV electron energy, 48 ml/min He makeup flow. SMB transferline temperature: 170ºC with temperature program after 3 min at 20ºC/min up to 230ºC. Backflush: The system has a backflush device that was activated after 6 min in some analyses. 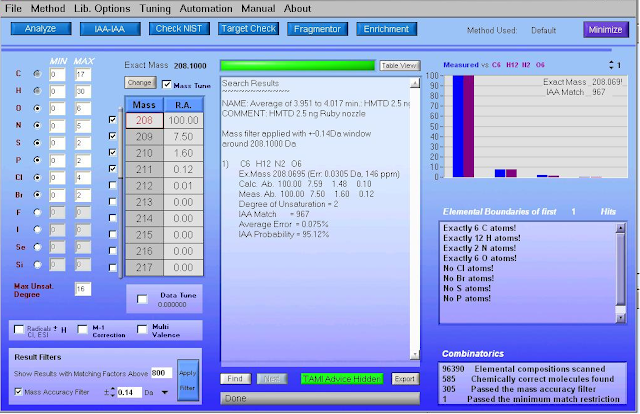 5975 mass range: 50-400 amu at about 4 Hz scanning frequency. In Figure 1 we demonstrate the analysis of a mixture of explosives with the 5975-SMB GC-MS with Cold EI. 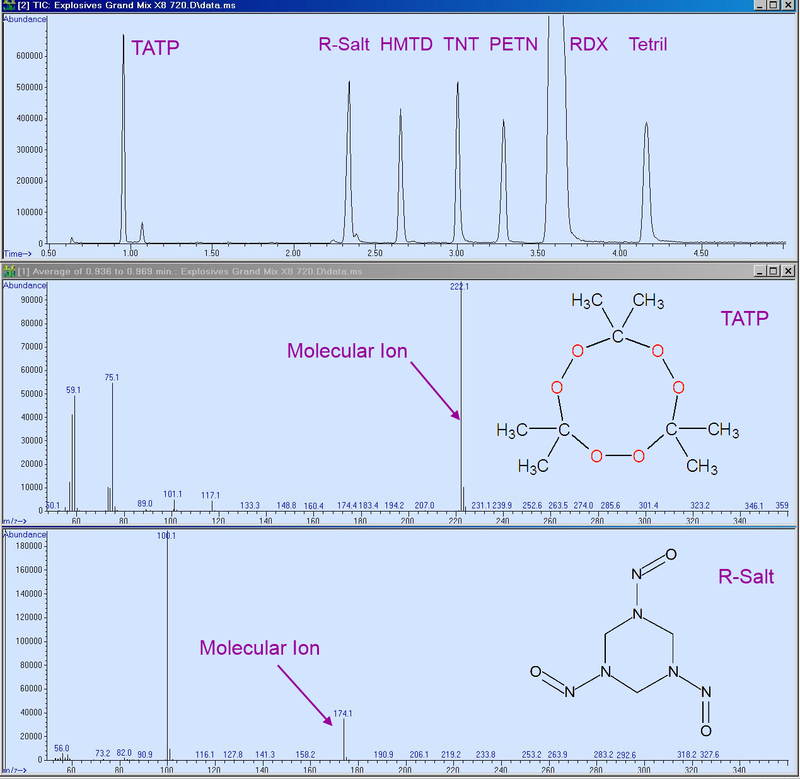 The total ion count is shown at the upper trace, Cold EI mass spectra of TATP is shown at the middle trace and that of R-Salt at the lower trace. The analyzed explosives in order of their elution times are: TATP, RSalt, HMTD, TNT, PETN, RDX and Tetril. The on-column amount is estimated at around 5-10 ng per compound while RDX is at a much higher amount. As shown, all the explosive compounds can be analyzed by GC-MS with Cold EI due to the use of a short column (6 m), high column flow rate of 10-20 ml/min and due to the use of a contact-free fly-through ion source. The subjects of how to extend the range of compounds amenable for GC-MS analysis and how it is obtained by GC-MS with Cold EI are described in details in reference [1, 2]. As demonstrated, the Cold EI mass spectrum of TATP is characterized by having a dominant molecular ion at m/z=222 while the Cold EI mass spectrum of R-Salt also shows abundant molecular ion at m/z=174. The availability of molecular ions for these labile explosives is very important and beneficial since: a) it ensures that the eluting compound is the intact explosive compound and not any of its degradation compounds that could be formed in its solution or GC injector, column and/or ion source; b) it significantly improves the measurement selectivity since matrix interference are reduced by about a factor of 20 every 100 amu . We further note that the chromatographic peak shapes are good with minimal or no tailing since ion source peak tailing is fully eliminated with the Cold EI contact-free fly-through ion source as described in . Figure 1. 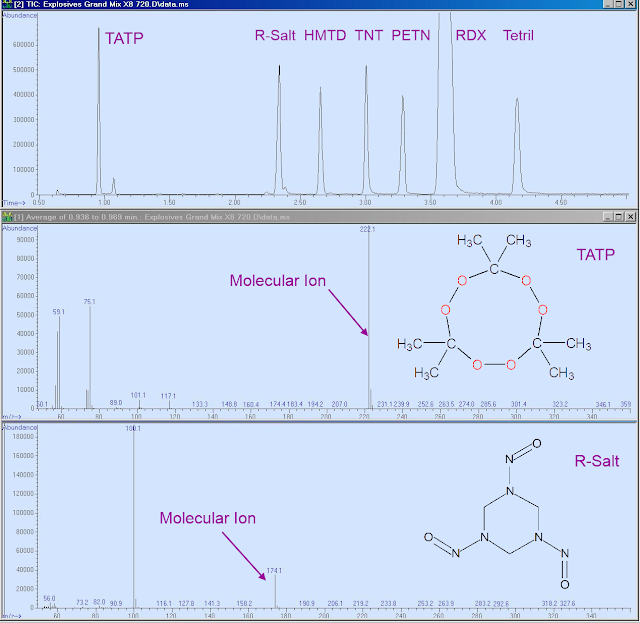 Explosives mixture analysis with the 5975-SMB GC-MS with Cold EI (TIC in upper trace) and Cold EI mass spectra of TATP (middle trace) and R-Salt (lower trace). The analyzed explosive compounds in order of their elution times are as indicated: TATP, R-Salt, HMTD, TNT, PETN, RDX and Tetril. The small peak after TATP is of TATP isomer. Click Image to Enlarge. Explosives compounds are polar and certain explosives are very polar and can therefore saturate the GC column at few nanograms on-column amounts. For example, we found that HMTD saturates the DB5MS-UI column already at 5 ng on-column amount and HMX at well below this value. Thus, the analysis of HMX is further challenging in view of its limited column capacity and in view of the fact that it is the least volatile among the organic explosives thus requires higher injector, transfer line and ion source temperatures that could degrade the other more volatile explosive compounds. The ion source temperature problem is eliminated with the Cold EI fly-through ion source while the transfer line issue is resolved via its temperature programming. Injector temperature programming could resolve this issue at the injector but we found that with pulsed high pressure injection with a short column we can properly inject HMX even at 160ºC injector temperature. 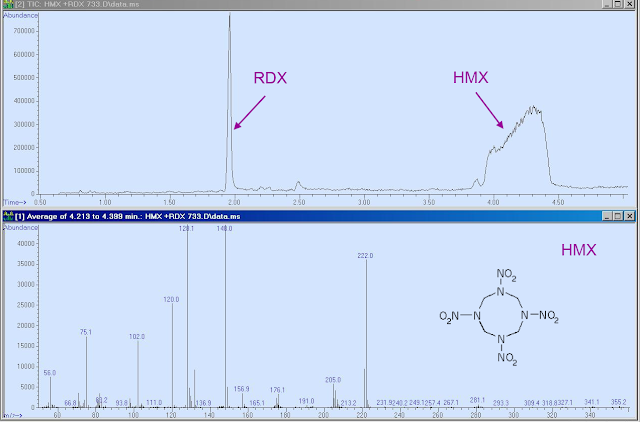 In figure 2, the total ion count mass chromatogram of RDX and HMX explosives mixture is shown (upper trace), as obtained with the 5975-SMB GC-MS with Cold EI. The Cold EI mass spectrum of HMX is shown at the bottom trace and while it is without a molecular ion even in Cold EI, unlike in standard EI the Cold EI MS of HMX is characterized by highly abundant m/z=222 fragment mass spectral peak that enables its selective detection in complex mixtures. We found that the Cold EI MS of HMX is easily identified by the NIST library with 75% identification probability. While we did not try to obtain a molecular ion for HMX by the use of cluster CI we assume that it will provide a protonated molecular ion in cluster CI as described for other explosives such as PETN and RDX in reference 1. Figure 2. 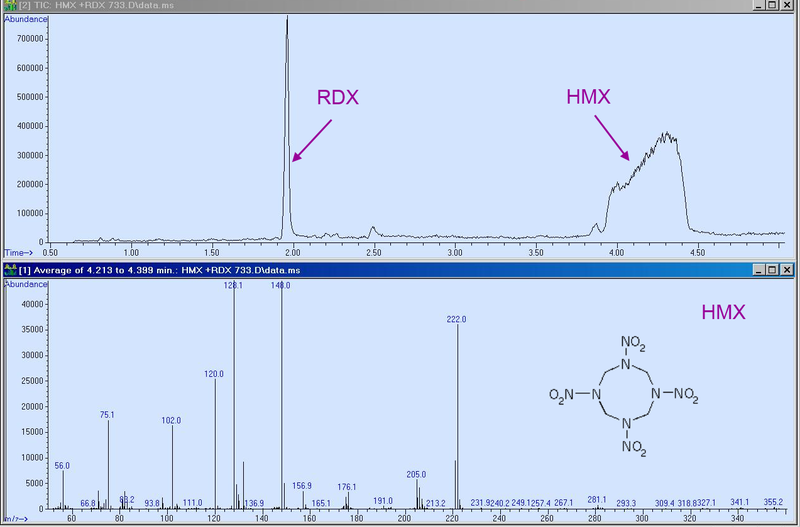 The analysis of RDX and HMX explosives mixture with the 5975-SMB GC-MS with Cold EI. The total ion count is shown at the upper trace while the Cold EI mass spectrum of HMX is shown at the bottom trace. Click Image to Enlarge. We also evaluated the analysis of several other explosives with the 5975-SMB GC-MS with Cold EI and for example we found that ETN is relatively easy to analyze while similarly to PETN it does not have a molecular ion even in Cold EI. PETN provides a protonated molecular ion in cluster CI  while in Cold EI it provides a useful high mass fragment at m/z=240 and ETN similarly exhibits a useful high mass fragment at m/z=226. Urea nitrate is another challenging explosive which is an inorganic explosive compound. We found that contrary to some perception it can be analyzed by the 5975-SMB GC-MS with Cold EI as it probably degrade at the injector into urea and nitric acid and thus it is detected as a broad GC peak with a strong mass spectral peak at the urea mass of m/z=60. We note that column saturation effects can be highly reduced via the use of 0.53 mm ID column which can be used with GC-MS with Cold EI but we did not explore the use of such a column. Restek offers its Rtx-TNT column with 0.53 mm ID that with film thickness of 1.5 µ, length of 6 m and 17 ml/min column flow rate provides good peak shape for HMX as shown in Restek's document. We note that the 5975-SMB GC-MS with Cold EI is compatible with the use of such column and high column flow rate. The analysis of Tetril by the 5975-SMB (last peak in Figure 1) is discussed in details in another blog article in reference  and in GC-MS with Cold EI it uniquely exhibits a molecular ion at m/z=287. We believe that among the explosive compounds, effective analysis of the peroxide explosives is of particular importance. 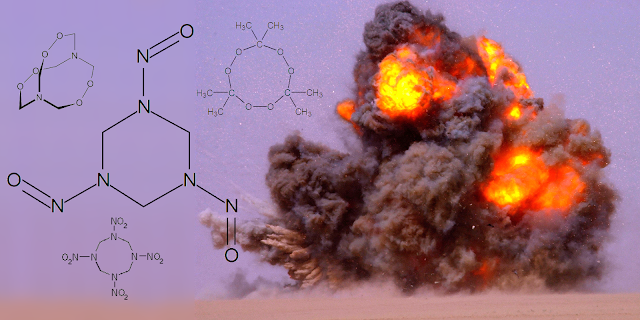 Terrorists use of peroxide explosive compounds such TATP (triacetone triperoxide, C9H18O6) and HMTD (Hexamethylene triperoxide diamine, C6H12N2O6) is growing due to their easy synthesis which means that modern analytical techniques of explosive analysis must be compatible and as effective with peroxide explosive analysis as with the traditional poly nitro explosives. However, these explosives are thermally labile and unlike the poly nitro explosives they have negative electron affinity thus can not be detected by GC-ECD and their LOD by IMS is relatively poor. The Cold EI mass spectrum of TATP is shown in figure 1 above which also demonstrates the detection of the second structural isomer of TATP as a small peak eluting just after the main TATP peak. HMTD is the second important peroxide explosive compound. The standard EI mass spectrum of HMTD was measured with MS probe as described in reference . However, we are not aware of any reported GC-MS analysis of HMTD, presumably due to its being highly thermally labile. Figure 3. HMTD analysis with the Aviv Analytical 5975-SMB GC-MS with Cold EI. 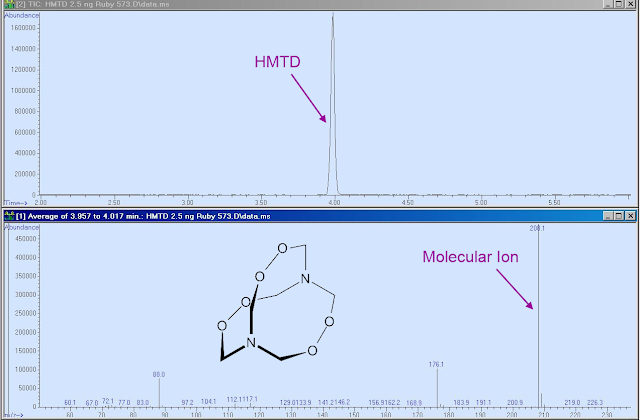 The upper trace shows the generated total ion mass chromatogram with only one peak of HMTD while the HMTD Cold EI mass spectrum is shown at the bottom trace with dominant molecular ion. 2.5 ng HMTD on column where injected via the injection of 50 ppm acetone solution with split 20. 15 m, 0.25 mm ID, 0.25µ film DB-5MS UI column was used with 12 ml/min helium column flow rate. The GC oven start was at 80ºC followed by 16ºC/min to 240ºC. Other Cold EI parameters are as in the analytical conditions summary above. Click Image to Enlarge. As shown in Figures 1, HMTD was easily analyzed with the 5975-SMB GC-MS with Cold EI and the analysis was reasonably fast with HMTD eluting at 2.65 minutes. In Figure 3 we show the analysis of 2.5 ng on-column HMTD with a 15 m column and 12 ml/min column flow rate. 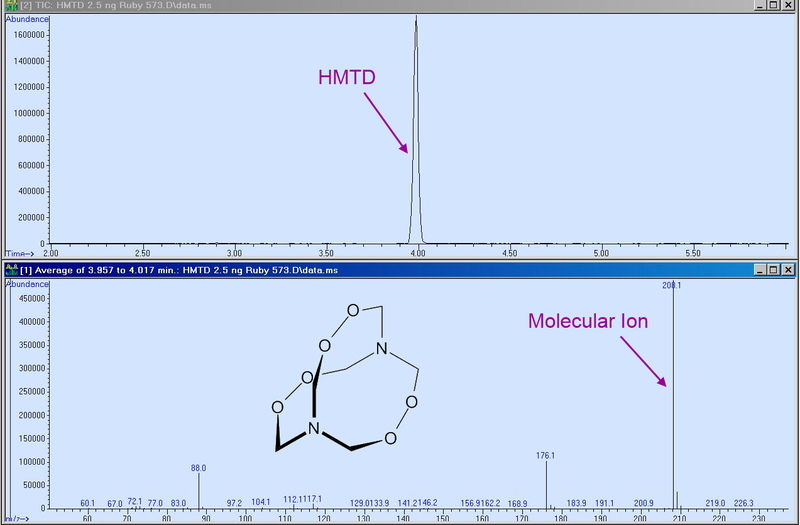 The total ion mass chromatogram is clean with a one peak only of HMTD. The Cold EI mass spectrum is characterized by the availability of a dominant molecular ion at m/z=208 and without intra column degradation. HMTD was not identified by the NIST 2005 library since it is not included in that library. However, the HMTD was fully identified as demonstrated in Figure 4 by the TAMI software based on isotope abundance analysis with a matching factor of 967 (0 is the lowest score and 1000 is the highest). In combination with the point decimal mass of 208.1 the TAMI generated identification probability was unambiguous with only one possible elemental formula, C6H12N2O6 which belongs to HMTD, with a matching factor of over 800. Furthermore, when a reconstructed mass chromatogram is plotted on the molecular ion m/z=208.1 the trace has a signal to noise ratio of over 100,000 (in peak to peak) as the generated RSIM mass chromatogram is clean without any noise prior to the elution time of HMTD. Consequently, we extrapolate low femtogram range detection limits for HMTD, particularly in SIM or simultaneous full scan and SIM modes. Similarly, TATP was unambiguously identified with the TAMI software via the provision of its correct elemental formula as number 1 in its table of elemental formulas. Figure 4. TAMI software generation of an elemental formula for HMTD. Only a one candidate elemental formula is generated in the TAMI table, the correct HMTD elemental formula. Click Image to Enlarge. Explosives analysis is a challenging task of growing importance. In this article we described and demonstrated explosive analysis by the Aviv Analytical 5975-SMB GC-MS with Cold EI. We demonstrated the use of one method that can serve for the analysis of all the organic explosive compounds, with improved sensitivity particularly for the more difficult to analyze explosive compounds such as the peroxide explosives TATP and HMTD and the nitroso explosive R-Salt. The enhancement of the molecular ions and/or high mass spectral fragment peaks in Cold EI improves the selectivity of explosive analysis and the use of short column with high flow rate enabled relatively fast analysis. We are working on the development of an Open Probe Fast GC-MS with Cold EI that will allow explosives analysis in real time including the step of sample handling, yet with ultra fast GC separation. Information on the Open Probe Fast GC-MS is available on request. This article describes the analysis of ten explosive compounds, among which we believe that the family of peroxide explosives requires special sensitive and selective means of detection due to terrorist threats from these explosives and due to difficulties in their sensitive detection in comparison with poly nitro explosives. While poly nitro explosives possess high electron affinity that enables their sensitive detection via GC-ECD and other electron capture related means, peroxide explosives such as HMTD and TATP possess negative electron affinity hence are incompatible with electron capture based detection. Finally, this demonstrated improved explosives analysis capability of the 5975-SMB GC-MS with Cold EI is added to several other advanced forensic analysis capabilities as outlines in many other blog articles listed in reference . Thus, the Aviv Analytical 5975-SMB represents a step forward towards achieving the ideal forensic GC-MS with improved detection and analysis of explosives, drugs, arson samples and unknown compounds. 1. A. B. Fialkov, A. Gordin and A. Amirav "Extending the Range of Compounds Amenable for Gas Chromatography Mass Spectrometry Analysis" J. Chromatog. A. 991, 217-240 (2003). 2. A. Amirav, "Extending the Range of Compounds Amenable for GC-MS Analysis" Advanced GC-MS Blog Journal, August 11, 2013. 3. M. Kochman, A. Gordin, P. Goldshlag, S. J. Lehotay and A. Amirav "Fast, High Sensitivity, Multi-Pesticide Analysis of Complex Mixtures with the Supersonic GC-MS" J. Chromatog. A. 974, 185-212 (2002). 4. A. Amirav. "Peak Tailing – Like an Iceberg, it Hides Signal More than Commonly Perceived" Advanced GC-MS Blog Journal, March 20, 2013. 5. A. Amirav, "Tetryl Analysis using the 5975-SMB GC-MS with Cold EI" Advanced GC-MS Blog Journal, October 3, 2013. 6. J. Oxley, J. Zhang, J. Smith and E Cioffi, Propellants, Explosives, Pyrotechnics 25, 284–287 (2000).